Bragg Organic Apple & Cinnamon Cider Vinegar is a refreshing drink based on the traditional apple cider vinegar recipe, which has been highly regarded throughout history. It is made by crushing organic apples until the juice is removed, and then placing them in wooden barrels to provide them enough time to mature. As the apples ferment, the substance is changed into vinegar and the cinnamon is added. Made with Organic Apple Juice & Organic Cinnamon. Sweetened with Natural Stevia. Great-tasting, refreshing drink. Great for a quick energy boost. Convenient pre-mixed drink. Certified organic and Kosher Certified. Paul C. Bragg campaigned for a diet and lifestyle that focused on natural live foods and a healthy regime for a vital and long life. These ideas, based around natural and organic foods, are gaining praise and acceptance world-wide. Pure distilled water, organic apple juice, Bragg organic apple cider vinegar, organic cinnamon and organic stevia extract. Enjoy as a drink whenever. Shake well before use. Below are reviews of Bragg Organic Apple Cider Vinegar Drink - 473ml by bodykind customers. If you have tried this product we'd love to hear what you think so please leave a review. 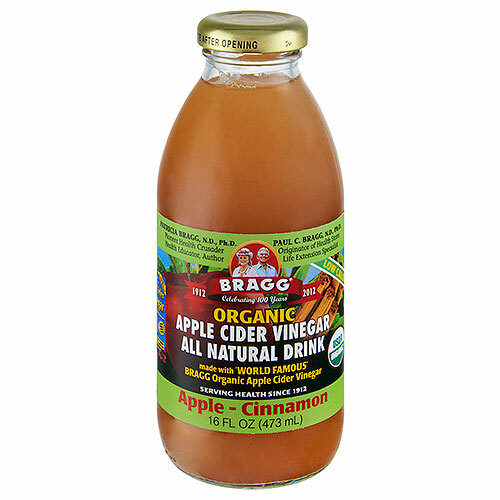 Bragg Organic Apple & Cinnamon Cider Vinegar is a refreshing drink based on the traditional apple cider vinegar recipe, which has been highly regarded throughout history.